A 4140 alloy steel screw can be nitrided satisfactorily, however, a nitriding steel (such as Nitralloy 135M) has aluminum added to give a better response in nitriding hardness, both as to consistency and depth. There are two types of nitriding that are common to screw manufacture: Gas Nitriding and Ion Nitriding. Gas Nitriding is used to create a surface hardness on the screw. The hard layer of steel will vary in depth from .007” to .015” depending upon the length of the nitriding cycle. The hard layer (usually well above 60 Rc) is achieved by heating the steel in an atmosphere of nitrogen (ammonia gas) at temperatures of 950 to 1050 degrees F. The nitrogen atoms are diffused into the surface of the steel, combining with nitride-forming elements, such as chromium, aluminum, molybdenum, vanadium, tungsten and titanium, to produce a very hard surface, particularly for the first .002” to .005” depth. 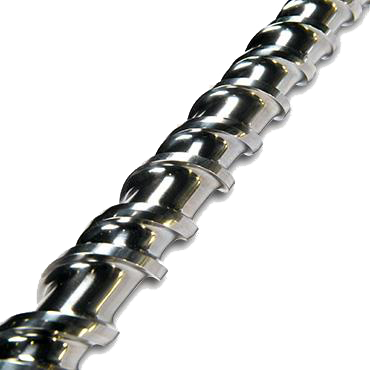 Nitrided screws have a very good wear resistance until the surface hardness is worn away. After the surface is worn .007”, wear accelerates and the screw may quickly be worn to a condition that is beyond repair. Ion Nitriding is similar to Gas Nitriding, using an electrical potential to ionize low pressure nitrogen gas. The ions produced are accelerated to the surface of the steel, heating it to a temperature for diffusion to take place (i.e., the uniting of the atomic nitrogen with the nitride-bearing elements in the steel). Because the temperatures are lower and pressures more controllable, a more uniform surface hardness depth may be achieved. The ionization occurs in a plasma discharge process which creates a glow, hence, this type of nitriding is also referred to as the “plasma method” or “glow discharge” nitriding.